The rugged, high and wild granite peaks of California’s Sequoia and Kings Canyon National Parks hold over 723,000 acres of federally protected wilderness. But like many wilderness areas in the national parks, they’re a sort of wilderness-management war zone. While the 1964 Wilderness Act prohibits motorized vehicles, such as helicopters, in wilderness, it makes some exceptions. Federal agencies typically evaluate the need to use helicopters in wilderness areas on a case-by-case basis, to determine whether they are the "minimum tool" it will take to do the job. But last April, Sequoia-Kings Canyon Superintendent Richard Martin issued blanket approval for his parks to use helicopters for routine maintenance of trails, backcountry ranger stations, radio repeaters, and for scientific research, when trails and weather conditions don’t allow the use of pack animals. Martin argued that the approval simply codified what’s been going on there for years. But Jim Walters, who worked in Santa Fe, N.M., as the Park Service’s deputy national wilderness program coordinator and the wilderness coordinator for the Intermountain Region, disagreed. 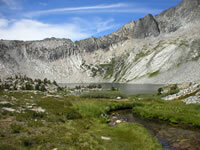 "It would establish a major precedent in the Park Service wilderness program," says Walters. "The parks have never had permission to simply write themselves a get-out-of-jail card." Walters argues that the approval violates the Wilderness Act, numerous Park Service wilderness orders and the National Environmental Policy Act. And, he adds, "It hasn’t gone out for public review." Walters wrote a lengthy memo criticizing the approval — and suddenly found that sticking up for wilderness was hazardous to his career. In July, he was removed from his position as the deputy national wilderness coordinator, and from the Park Service’s wilderness steering committee. In early August, Walters was told that he was being transferred from Santa Fe, where he’s lived and worked for 16 years, to the Park Service’s regional headquarters in Denver. Mike Snyder, the deputy director of the Park Service’s Intermountain Region, says, "The determination was made that having a deputy to the Washington office in Santa Fe was not a real effective way to get things done. Wilderness was so important to us that the person who coordinated our wilderness activities needed to be sitting with our regional management folks in this region, and that’s in Denver." Rather than transfer, Walters retired in early January. Soon after, he sent a five-page letter to Park Service Director Mainella, in which he wrote that: "(1) the agency has failed to properly identify and protect its wilderness resources, (2) senior level managers continue to demonstrate either a lack of concern and/or an open hostility to the Service’s wilderness responsibilities, and (3) park managers continuously attempt to ignore or circumvent the instructions of the Wilderness Act and NPS wilderness policies in carrying out their other duties." Walters’ concerns weren’t just about Sequoia-Kings Canyon, and they aren’t anything new. Three internal Park Service reviews, the most recent in 1993, have found the wilderness system in disorder. And last January, The Wilderness Society filed a lawsuit against Mainella and Interior Secretary Gale Norton for failing to comply with the Wilderness Act and numerous other laws related to wilderness protection. Among other things, The Wilderness Society charged that the Park Service failed to conduct wilderness studies for 39 units of the National Park System, and failed to create wilderness management plans for three-quarters of the units in the system that include designated wilderness. Some of the omissions are spectacular — and many of them predate the Bush era by several administrations. Park Service recommendations to designate more than 1 million acres of Lake Mead and Glen Canyon National Recreation Areas as wilderness have languished in the Park Service and in the secretary of the Interior’s office for more than two decades, and have never been forwarded to the president and Congress. In Death Valley National Park, where over 3.1 million acres of wilderness were designated by Congress in 1994, the Park Service has never prepared a wilderness management plan. Back in Sequoia-Kings Canyon, Superintendent Martin stands by the blanket helicopter approval. "We believe that the public, the true users of wilderness — whether Mr. Walters is on board with this or not — want to see what is happening in a collective fashion." He says the approval will be made available for public comment sometime this year. The author is HCN’s associate editor.